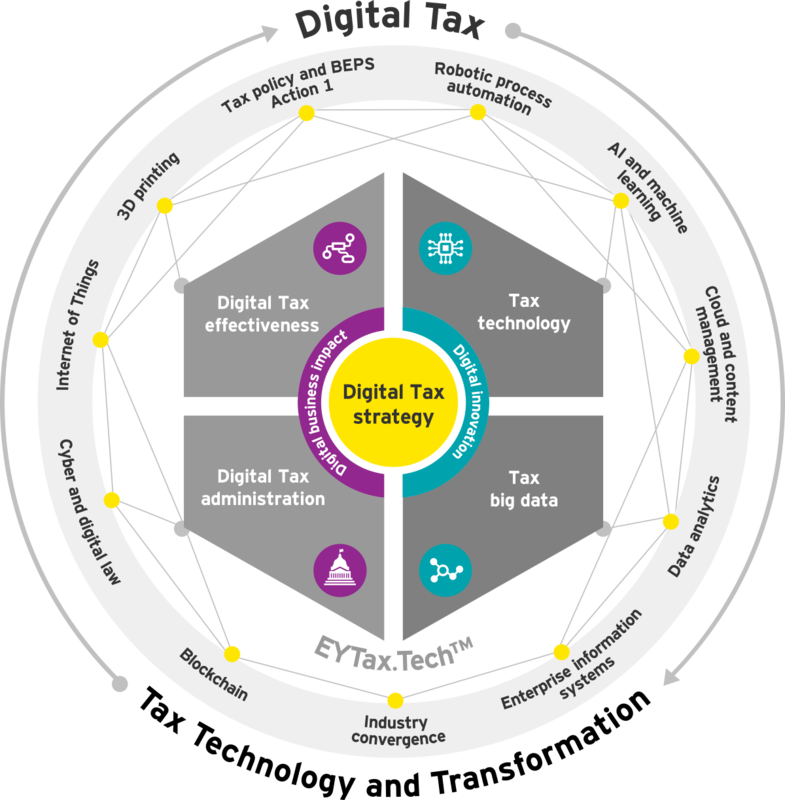 EY’s broad approach to digital tax strategy, covering digital tax effectiveness, digital tax administration services, tax technology and tax big data, helps you identify your tax function’s immediate challenges and develop an enhanced operating model strategy fit for the transformative age. Digital tax strategy takes an in-depth look at tax from different angles including a tax department’s fundamental operations. This is illustrated below through four primary quadrants that highlight the relevant connected operations: digital tax effectiveness, digital tax administration services, tax technology and tax big data. These four areas are enabled through our various connected solutions and teams as well as in an overarching approach that connects them to business transformation. EY Tax Technology and Transformation practice and EY Global Innovation teams help bring our digital tax strategy to life. They’re focused on the current and future state of technology and innovation in tax, and on effecting the changes in the tax function to keep pace with changes in the landscape. EY Digital Tax Effectiveness platform offers an interwoven suite of services connected across all of our professional tax areas. Data and analytics drive all things digital. You may already be using big data to track and improve customer activities and experience. Now, managing tax big data and leveraging it for better visibility of your tax obligations has become a critical success factor as well.